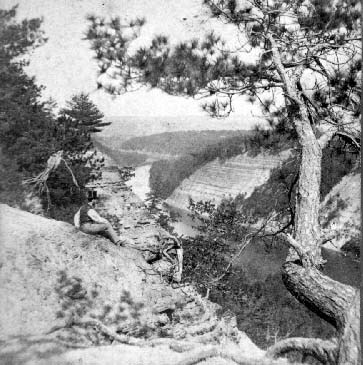 "578-Genesee River High Banks below Mt. Morris, N.Y."
This view was taken from the western bank of the Mt. Morris Canyon looking down river. Nearly a century later a concrete dam would be built in the gorge nearly below where the gentleman is sitting. The lands in this view were not part of the Mr. Letchworth's Estate. The Glen Iris was about seventeen miles up the Genesee River from this point.